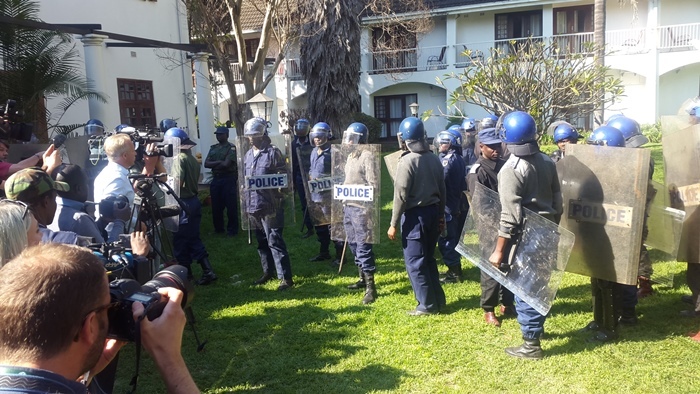 The police later apologised for riot cops storming Bronte Hotel in Harare, ordering journalists to leave the venue of an MDC Alliance press conference. 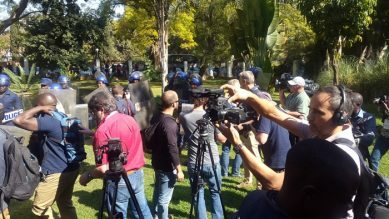 The so-called new dispensation in Zimbabwe being touted by president-elect Emmerson Mnangagwa seems to have gotten off to a rocky start after riot police officers today stormed an MDC Alliance press conference at Bronte Hotel in the capital, Harare, and almost beat up journalists, ordering them to leave the venue. Foreign scribes saved the day for locals, as they stood their ground and demanded to know under whose authority the law enforcers were chasing away the journalists. Miffed by the intimidating police details, who time and again beat their shields using batons to ward off the news men and women, the journalists were not moved, even when a senior police detail called authorities and briefed them that the scribes had refused to budge. Information minister Simon Khaya Moyo, who is also Zanu-PF spokesperson, had to rush to the venue and ordered that the press briefing goes ahead. “The press conference must go ahead,” was all he said repeatedly. Mnangagwa commented on micro-blogging site Twitter that the matter would be investigated. “The scenes today at the Bronte Hotel have no place in our society and we are urgently investigating the matter to understand exactly what happened. Over the past nine months, we have protected freedom of speech, of assembly and the right to criticise the government,” he wrote on Twitter. Mnangagwa added that him being declared the winner was “an indispensable part of the new Zimbabwe”. “It is non-negotiable and will not change. We won the election freely and fairly, and have nothing to hide or fear. Anyone is free to address the media at any time,” he said. 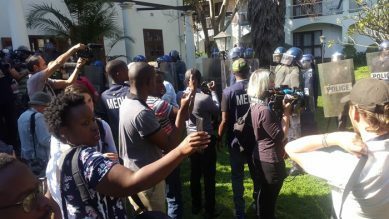 The Zimbabwe Republic Police later apologised, saying in a statement: “The ZRP sincerely apologises, and wish to state that we respect freedom of the media, freedom of expression and freedom of association as provided for by the Zimbabweans laws,” the law enforcement agency said. The press conference fracas preceded Chamisa’s address to the media, where he alleged they had evidence of how Zanu-PF “stole” the election. The MDC Alliance leader said the police action on journalists was “unacceptable” and “unnecessary”, adding that was not the “behaviour of a people who have won; it can only be a behaviour of those who have lost”. Chamisa, a leading presidential candidate in Monday, July 30’s elections, alleged there were inconsistencies with regards to the results announced by the electoral management body, the Zimbabwe Electoral Commission (ZEC), against what was on the V11 forms. He said for being peaceful and law abiding during the election period, Zimbabweans were thanked with “bullets, guns, bombs, grenades, tanks”, saying it was a clear indication that Zanu-PF had panicked after being defeated. “You don’t give bullets, guns to those who have voted for you. You give them celebrations. Go round the country, you find that there is not jubilation, there is no celebration,” the 40-year-old leader said.